I’m a little obsessed with meatballs. To me they’re sort of like the Italian taco in that they can be anything but Italian – like a taco can be anything but Mexican – and there are endless ways to make them. Coming from an American-Italian family, I didn’t realize how versatile meatballs could be. We always had them with spaghetti, mostaccioli or other pasta noodles and maybe every now and then there would be a Swedish meatball thrown in. That said, meatballs actually didn’t originate in Italy, but we more of an invention of poor, Italian immigrants in the early days of the United States. Meat was a staple in their diets from about 1880-1920 and that made meatballs an easy meal. It was paired with canned tomatoes because that was one of the only things available in local grocery stores and the spaghetti was added in because that was also often the only noodle available in the early U.S.
Keeping all that in mind…this recipe is anything but Italian or America-Italian. 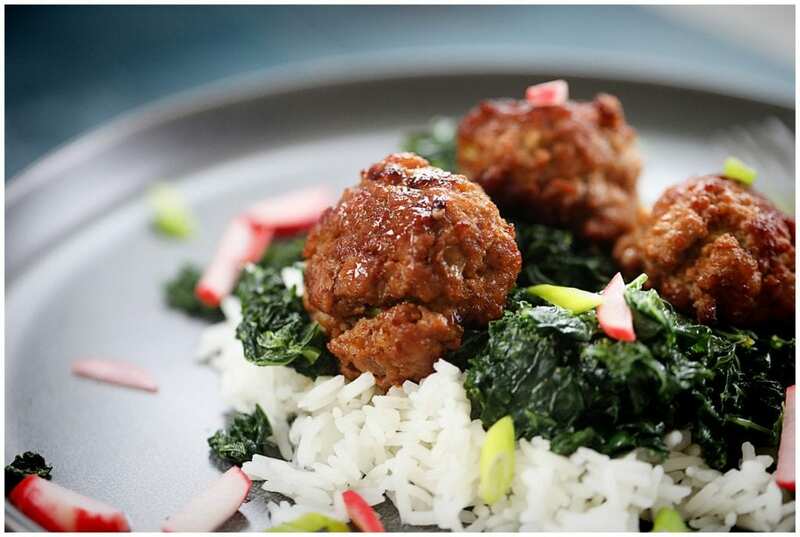 These Soy-Glazed Meatballs have an Asian flair and have become a fast favorite in our house. 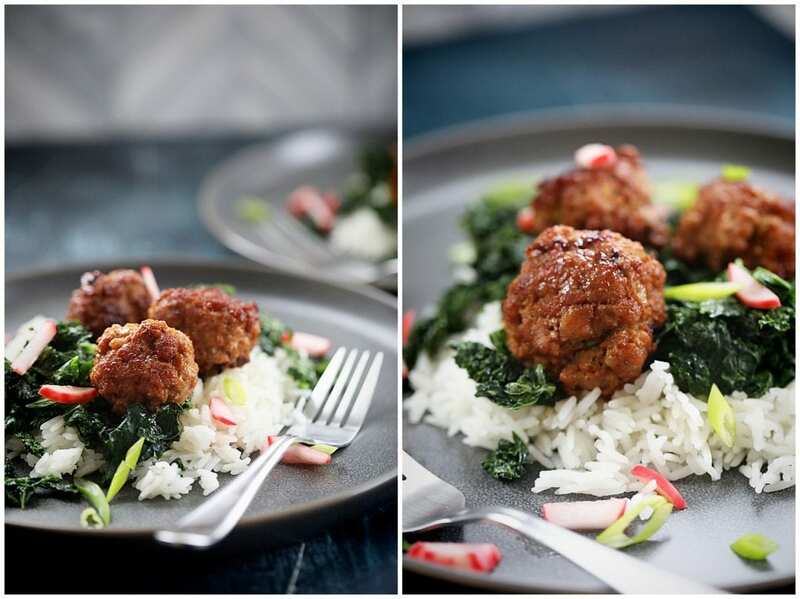 The soy glaze provides a savory add to these meatballs that are made with ground pork mixed with fresh ginger and Panko bread crumbs. It’s an easy recipe that takes about 30 minutes to make and they’re big enough to make a meal of by eating just a few. But I promise, you’re going to want seconds. Both my husband and I went in for more. For more main dish recipes, click here. Try it with this refreshing drink too! 5 Tbsp. of rice wine vinegar – Separate this by 3 Tbsp. and 2 Tbsp. In a small pot, boil your rice according to instructions on the bag or box. Slice your radishes thinly and add them to a small bowl with 3 Tbsp. of the rice wine vinegar. Add 2 Tbsp. of olive oil to a large pan and once hot, add kale to the pan and sauté with salt and pepper for a few minutes until it’s wilted. Remove from pan and keep in a warm place. Mix together ground pork, Panko bread crumbs, ginger and the white bottoms of the scallions. Form the mixture into your meatballs. If you want to have them really consistent use a melon baller. You should get about 14 meatballs from the mixture. Using the pan that the kale was in, wipe it out and heat through the other 2 Tbsp. of olive oil. Add the meatballs in brown them on all sides. Turn every four to six minutes. Mix soy sauce, 2 remaining tablespoons of rice wine vinegar and water together and then add it to the pan with the meatballs. Tip the pan a bit and spoon the sauce over the meatballs for a few minutes. The sauce will thicken as it cooks. Cook them like this four about 4 minutes and continue to spoon the sauce over them. 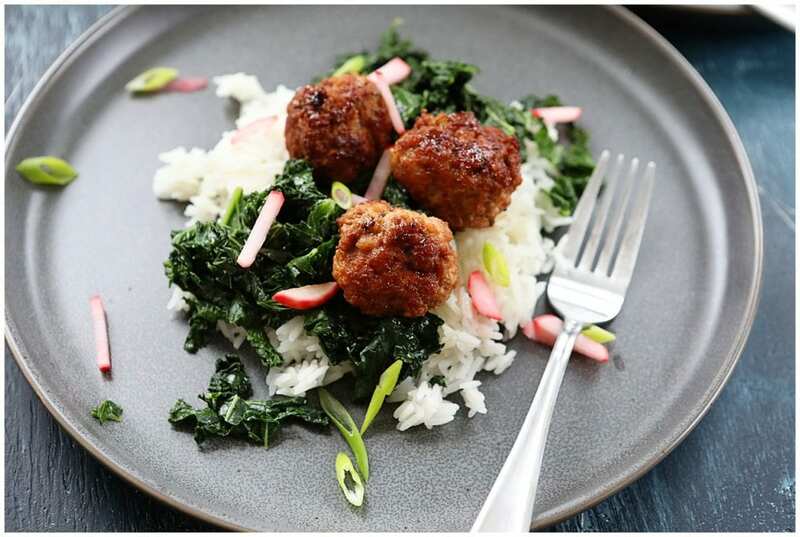 Divide your rice among your plates, top it with your kale and add about three or four meatballs to each plate along with radishes (drained) and green onions. Serve immediately. Tasty and healthy sounds like a winner to me. I can’t wait to try this. I LOVE meatballs. 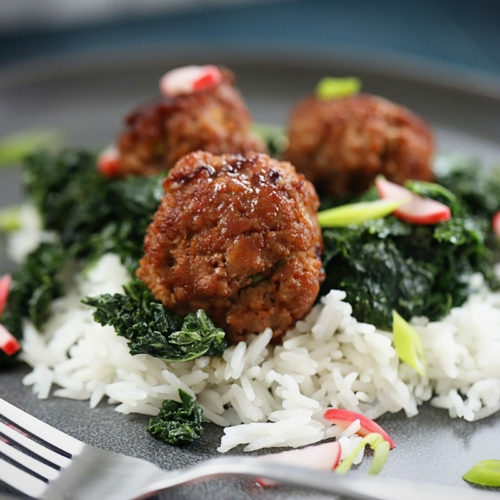 Meatballs are so versatile and easy to make. They freeze really well so they can be a great make ahead for those busy nights. This looks like a delicious meal! I have always enjoyed meatballs. I need to make this for dinner one night. Oh my goodness this looks absolutely delicious! 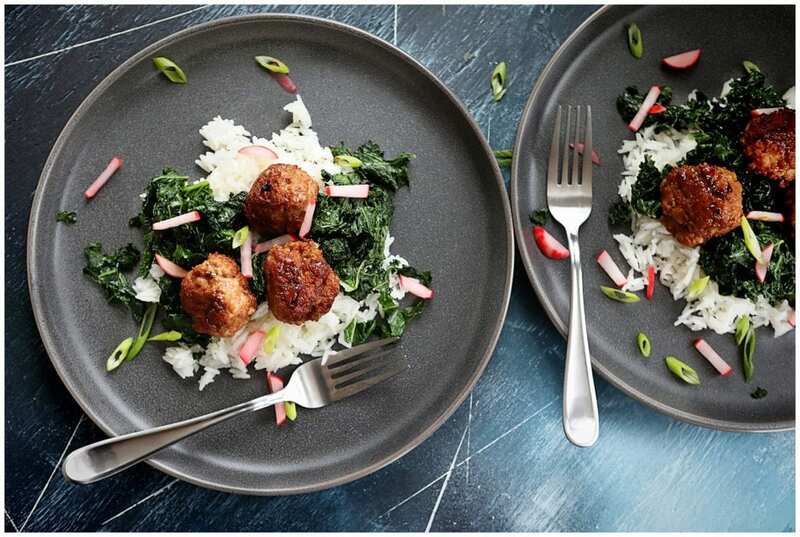 I do love a good meatball meal and this sounds like it would be incredible! Meatballs are the favorite of so many people and this new way to cook them works so well. I know anyone who loves meatballs will like this recipe. I am big fan of pickled radish, and I love the combination of flavors you have here. Bravo. Ohh this sounds so delish! I love the flavor play here. Can’t go wrong with meatballs. What a scrumptious recipe, my mouth is watering here. These meatballs look delicious. 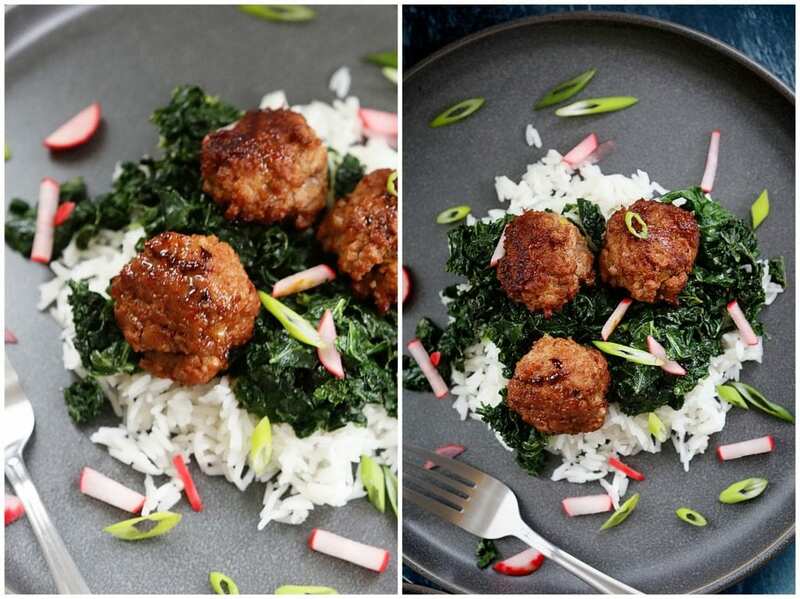 I often get tired of a traditional meatball, but the soy glaze on this sounds so flavorful and yummy! I’m all for unique meatballs like this. This is a delicious and easy recipe. I need to make these soon! 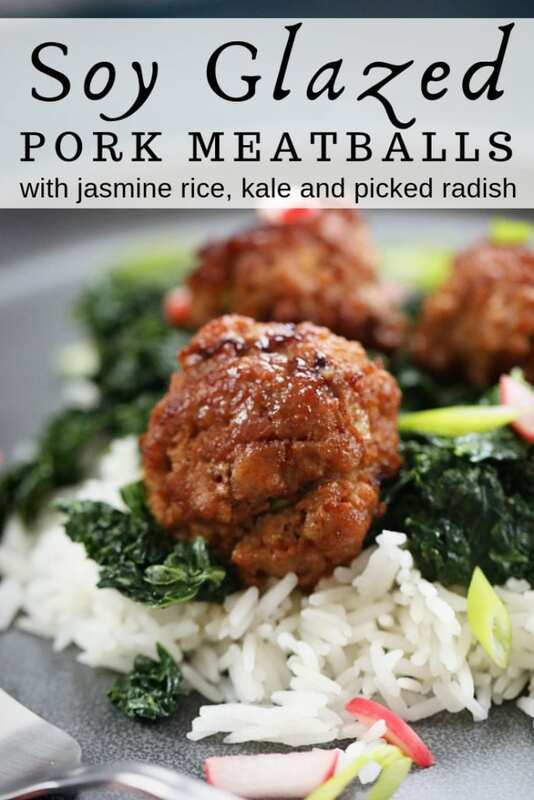 These sound like a delicious twist on meatballs. I love the history you gave of the original ‘where did the meatball’ come from. I enjoy your post and will be trying your recipe soon. Wow, this sounds so delicious. I am a big fan of meals with big flavors like this one. These sound delicious and really unique! These meatballs look delicious. We love our meatballs in this house. I can’t wait to try these. This looks like the perfect tonight dinner! My whole family will love it! So yummy! This seems to be delicious. Could we substitute chicken? I know this may sound crazy, but my kids LOVE kale! I’m going to have to make this for them. Yum, this sounds so delicious!! I can’t wait to give this recipe a try, I think my entire family will love it!!! I think my picky kids may even like this one! Id leave out the kale and radish for them. Great, you’re combining with leafy vegetables, kale. I choose not to mix meat or fish protein with starchy carbohydrates like rice and pasta. But kale and radishes look awesome! This looks flavorful! We tried different recipes for meatballs, I am excited to taste this! I love a good meatball! This recipe sounds delicious! I really need to add it to our menu soon! I make something similar but I use teriyaki sauce to glaze the meatballs. I will try your recipe too. 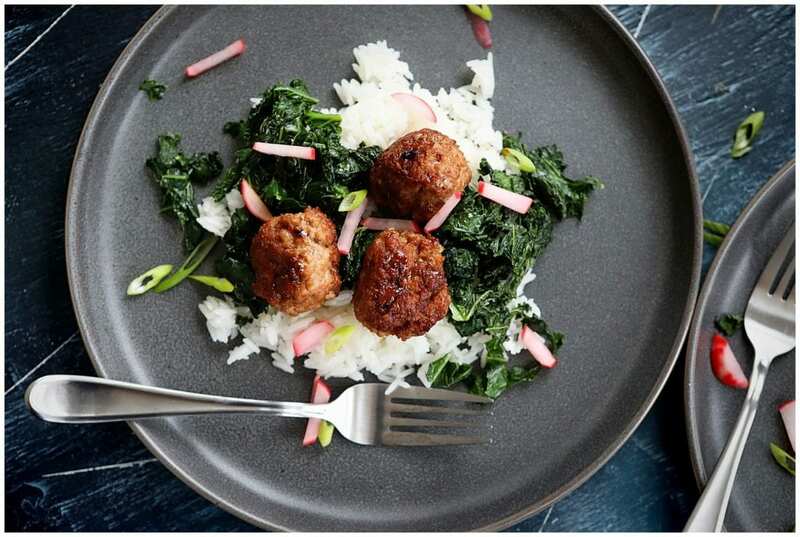 The kale and radish would really pair well with the meatballs. I bet those meatballs taste amazing. And I truly love the addition of kale. Love kale. I’m going to add your recipe on the menu next week. Thanks! They look delicious! I have never had meatballs with an Asian flair, but I think I would love them. I love meatballs but have never made pork meatballs before! I need to try this recipe asap!! 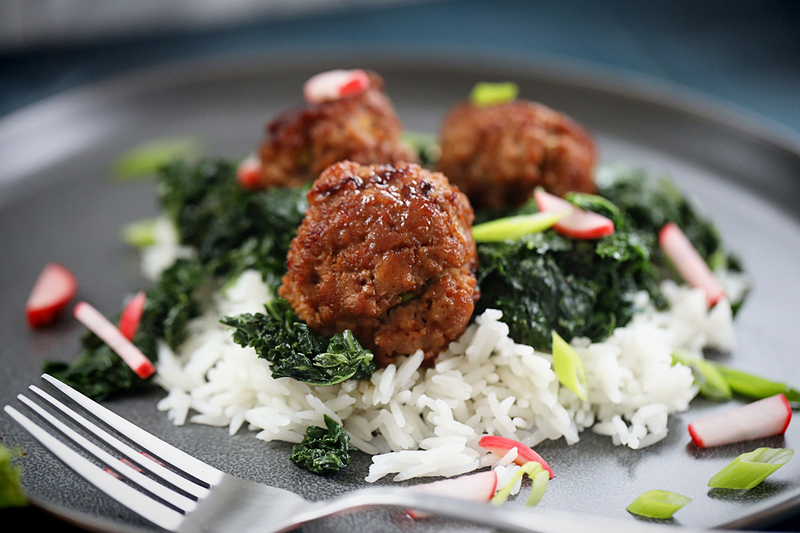 Ground pork is such a great way to make meatballs. These look amazing. And as a huge radish fan, I bet these pickled radishes are amazing!!! This looks like a great recipe to make for kids. I would love to try making this sometime.